In the aftermath of Hurricane Florence, the Food Bank continues to respond to immediate needs across our service area. People are still displaced throughout our 26 affected counties, including 22 counties declared federal disaster areas. Food, water, and supplies are being distributed to the communities in urgent need. 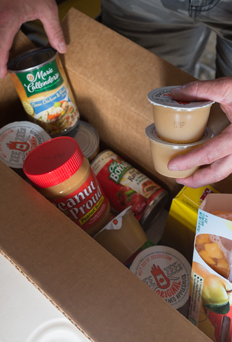 Your tax-deductible gift to the Food Bank of Central & Eastern North Carolina will help hungry families and children right here in our community. Once disaster relief and recovery needs have been met, remaining funds and food will be used to support our ongoing hunger-relief efforts. Every $10 you donate helps provide up to 50 meals!